The parliamentary speaker has been forced out, the latest twist in Mongolia’s long-simmering political scandals. On January 29, a majority of members of Mongolia’s parliamentary body, the State Great Khural, voted to oust the unicameral body’s speaker, Miyegombyn Enkhbold. The ousting of the speaker, who was formerly the chairman of the majority Mongolian People’s Party, comes after months of political turmoil. In the parliament’s special session, 43 out of 65 members who attended voted to throw out Enkhbold, who was embroiled in multiple corruption scandals. The ousting is the most recent chapter in a slow-moving political crisis causing Mongolians have continuously lose faith in their government due to rampant corruption and inefficacy, particularly in addressing an annual air pollution-induced public health crisis in Ulaanbaatar. In spite of widespread calls for Enkhbold’s resignation from both major political parties, the speaker had refused to step down for over a month in the face of major demonstrations in front of Mongolia’s parliament building. Since early December, more than half of Mongolian MPs boycotted plenary sessions in protest, which stalled out all legislative action for 40 days. The extraordinary measure to oust the speaker, who had formerly served as Mongolian prime minister and mayor of Ulaanbaatar, comes after a newly minted law approved on January 18, when parliament members granted themselves the new power. The original proposal for the bill was put forth just after the new year by President Kh. Battulga, who is from the opposition Democratic Party. Mongolia’s government has been in crisis due to a series of corruption scandals implicating leaders in both major political parties, whose platforms are virtually indistinguishable. Even after a new speaker is chosen, likely in early February after the Lunar New Year, the inter-governmental and inter-party conflict will continue to test Mongolia’s fledgling democracy. More than just holding up the passing of budgets and the development of legislative priorities for 2019, the gridlock has threatened the girders of Mongolia’s political system. Critics have argued that the president proposing the bill sets a dangerous precedent for others to propose timely legislation to their benefit. Notably, President Battulga has also ordered for an inquiry into former President Elbegdorj in relation to the former’s negotiation of major mining deals while president. 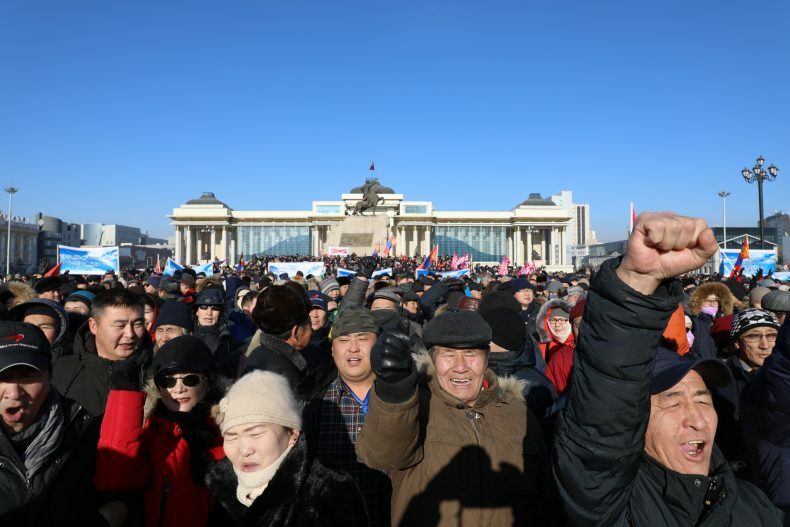 Demonstrators cheer with excitement at the January 10th rally against the former parliament speaker at Sukhbaatar Square. Photo by Peter Bittner. Since late November, demonstrators have targeted Enkhbold due to his connection to a number of high-profile corruption scandals, which are still ongoing. Most notably, Enkhbold has been implicated in the long-unresolved 2016 60 billion MNT case, in which a group of politicians were accused of conspiring to sell government offices in return for raising 60 billion tugrik (roughly $22 million). The speaker has not been named directly but has been allegedly associated with last year’s Small and Medium-sized Enterprise Development Fund (SME) case. In the SME scandal, a variety of high-profile public officials granted relatives or friends money intended for small business owners. The funds were originally intended to help offset Mongolia’s heavily mining-dependent economy and stimulate the local-level economy. Opponents, even in his own party, allege that Enkhbold runs a secretive group of leaders from across both major political parties known as MANAN, or “fog” in Mongolian, which has become synonymous with a shadowy oligarchy. In Mongolian, the word MANAN also combines the acronym of the two major political parties, the Democratic Party and the Mongolian People’s party. The series of protests surrounding the SME scandal began in November, shortly after Prime Minister Ukhnaagiin Khurelsukh (from Enkhbold’s own party) narrowly escaped a vote of no confidence. The prime minister deflected criticism and accused Enkhbold of corruption. The scandals have been widely covered in local media, and attracted outrage from average Mongolians. 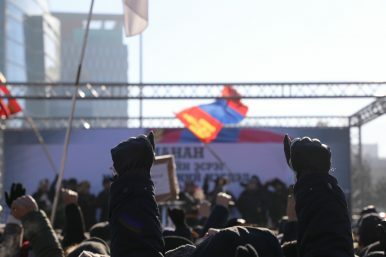 The latest major political protest took place January 10 at Sukhbaatar Square and targeted Enkhbold. Like the previous protest on December 27, there were tens of thousands of demonstrators. Ganuhuyag’s comments are emblematic of a growing public distrust in Mongolia’s governing class, and increasing disillusionment with the country’s media, both of which score low in global transparency ratings. Occupiers in traditional gers, or yurts, register protest signatures against speaker Enkhbold at Sukhbaatar Square on January 13. The banner says “Protest against the tyranny of MANAN!” Photo by Peter Bittner. 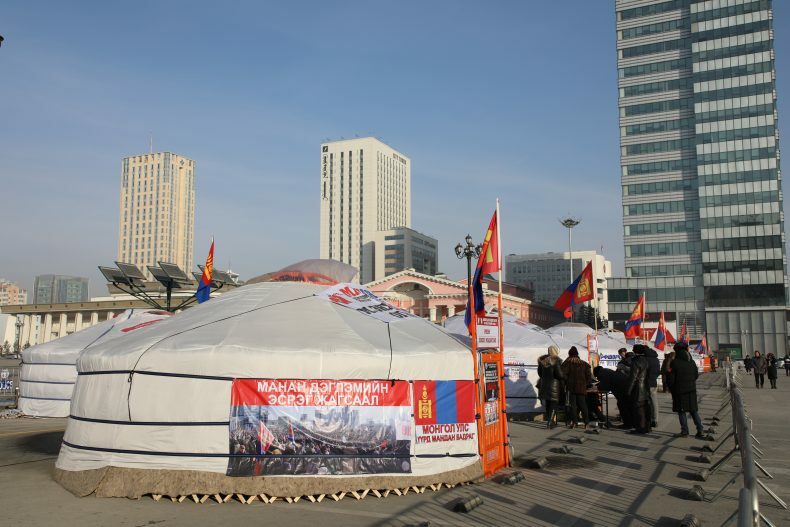 Since the demonstration, dozens of “gers,” or yurts have occupied Sukhbaatar Square, the central government plaza, with at least 10 Mongolians promising to go on hunger strike. One demonstrator, Batzorig, said, “I am one of 300 people who protested in 1989 in the Democratic Revolution. Look at what the people we trusted since that time have done! This is unbearable. Peter Bittner is a freelance journalist based in Ulaanbaatar, Mongolia. Tuguldur Chuluunbaatar and Anand Tumurtogoo contributed reporting to this story.